Humphrey finished his 14th London Marathon in a time of 4h49min. It was a great race…..
Humphrey started quite near the back of ‘pen’ 9 and jostled for position with the Rhino’s who sneaked round on the right hand side just before the start line. A group of happy skiers also pulled alongside, they looked cheerful enough but it would be a long race for them (a few days I am sure). The early rain was welcome relief although Humphrey’s fur soaked it up and let off a little steam as the day wore on. The rain cleared by the 4 mile the heat picked up. Humphrey had time for a quick interview with the BBC (see link below) near the Cutty Sark , and ran steadily up until half way. Thanks to all our supporters and sponsors and everyone on the day that made it such a success. 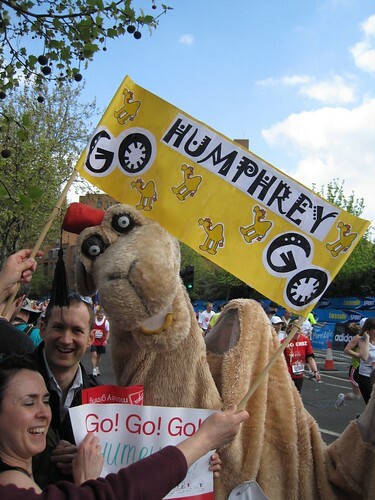 Well done Virgin for putting on such a great event, Humphrey will be back next year for his 15th!